rainbow crystals: pink, yellow, green, blue set of TWO This is a handmade ear cuff that is designed to fit all ears! To fasten, pull out the top of your ear and slide the cuff down onto the middle ear. Each stone is prong set so do not try to change the shape or tighten it or you could risk breaking your cuff. The cuff will likely fall at an angle, so let gravity do its thing! arrowhead 3" bone arrowhead with rhodium crystal edge attach to your favorite necklace chain! dagger 3" bone arrowhead with pavé crystals attach to your favorite necklace chain! evil eye 2.25″ turquoise enamel w/ pavé accents attach to your favorite necklace chain! evil eye 2.25″ sherbet enamel w/ pavé accents attach to your favorite necklace chain! 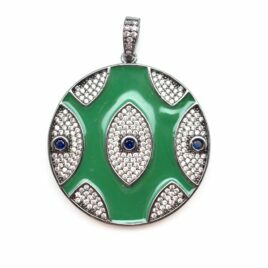 evil eye 2.25″ green enamel w/ pavé accents attach to your favorite necklace chain! evil eye 2.25″ mustard enamel w/ pavé accents attach to your favorite necklace chain! evil eye 2.25″ cobalt enamel w/ pavé accents attach to your favorite necklace chain! evil eye 2.25″ pink enamel w/ pavé accents attach to your favorite necklace chain! smooch 2.25″ pink enamel w/ pavé lip accent attach to your favorite necklace chain! smooch 2.25″ turquoise enamel w/ pavé lip accent attach to your favorite necklace chain! smooch 2.25″ white enamel w/ pavé lip accent attach to your favorite necklace chain! evil eye 2.25" pavé pink + orange crystals set in rhodium attach to your favorite necklace chain! lightening bolt 1.75" green enamel w/ pavé accents attach to your favorite necklace chain! lightening bolt 1.75" white enamel w/ pavé accents attach to your favorite necklace chain! lip gold pavé crystals attach to your favorite necklace chain! lip gunmetal pavé crystals attach to your favorite necklace chain!